2. What kinds of architectural drawings do we hold? Use this guide for an overview of The National Archives’ collection of architectural drawings and related records and for advice on how to find them among our vast holdings. The guide does not cover building contracts, accounts or correspondence. We do not hold any architectural models. Copies of all of the architectural drawings illustrated in this guide are available to buy through our Image Library. The National Archives holds many thousands of architectural drawings and related records, covering a very wide range of buildings and other structures, most of which date from the 18th, 19th and 20th centuries. These include plans, elevations, sections, perspective drawings and various other depictions and details of architectural works, including some iconic British landmarks and major engineering projects. We also hold site plans, which range from elaborate depictions of houses and grounds to simple outline block plans. Elevation of Admiralty Arch in London, 1907 (catalogue reference WORK 30/3276). This drawing is held at The National Archives among the records of the Office of Works and its successors. Before the 20th century the British government’s interest in architecture was largely confined to public and Crown buildings and schemes, and works by local authorities under various acts of Parliament. The records we hold very rarely represent the full range of drawings produced for any building project; we usually hold only a handful for a particular structure or scheme, although in a few cases a large number have survived (notably for the Houses of Parliament and the Royal Courts of Justice). Many older plans and drawings have not survived, and large numbers are held by other institutions (see section 7). Because of the Crown’s landholdings, and litigation relating to privately-owned land, we hold some records of buildings and structures on landed estates; but except in the case of the Crown Estate we are seldom the best place to start a search for such material. Many drawings are held among the records of the Crown Estate Commissioners, and the Office of Land Revenue Records and Enrolments and its predecessors and associated departments. 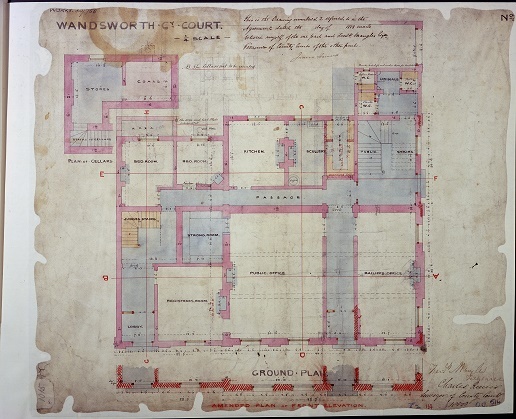 A ground floor plan of Wandsworth County Court in 1858, held among the records of the Office of Works and its successors (catalogue reference WORK 30/758). We hold a range of drawings and plans relating to local municipal buildings, including schools, hospitals, poor law buildings, Metropolitan Police stations and other civic structures. The majority among the records of the Ministry of Housing and Local Government and successor and related bodies. We also hold various plans relating to substantial complexes, such as housing estates, naval dockyards, or the Festival of Britain site, as well as a range of other sites and buildings. Many plans and drawings of railway stations and hotels are among the records of pre-nationalisation railway, canal and related companies in the British Transport Historical Collection and those created or inherited by the British Transport Commission, British Railways Board and successors. We also hold drawings of buildings and structures outside the British Isles, which were created or collected in the course of British government business abroad and in the work of the armed services, both in foreign countries and, during the years of the British Empire, colonies. Drawings of fortifications are particularly well-represented. The place to start a search is our online catalogue (see 3.1). However, many drawings are not listed in our catalogue, often because they belong to larger documents (‘parent’ files) whose catalogue descriptions are limited to broad details. 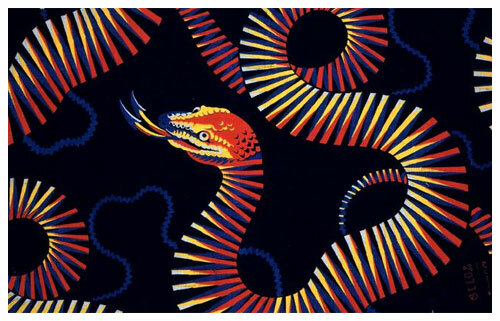 Drawings are often filed or bound up with correspondence and other records generated in the course of the government business of which they formed a part. Some government departments created discrete series of maps and plans but even with these departments there are likely to be at least as many drawings among their respective text-based records. The most detailed listings of drawings are those that appear in the published and unpublished catalogues, available in The National Archives library and reading rooms in Kew. If your online catalogue searches are unsuccessful you should turn to these paper catalogues (see 3.2 and 3.3), though you will need to visit us to do so. As a last resort you can return to the online catalogue and try speculative searches of the records by searching for ‘parent’ files. For example, to find architectural drawings of a hospital you could try a search within Ministry of Health files for the area where the hospital is located, or for ‘hospital building programmes’ or any other description that may match your research topic. You can find some architectural drawings (usually described as ‘plans’) by using keywords to search for the short descriptions of them in our online catalogue. Some drawings and plans are individually described, others are only described as forming part of a file or a whole series in a wider description. Bear in mind that searching with ‘plan’ will find references to ‘plans’ and ‘planning’ which have nothing to do with architecture. To target the records of a specific department, use the advanced search of our catalogue or the key series described in section 5 of this guide. The following resources, created by the Public Record Office, the forerunner of The National Archives, are held in the Map and Large Document Room at our building in Kew. A card from the ‘Mapmakers’ card catalogue indicating the document references for architectural drawings by Marc Isambard Brunel, an engineer, father of Isambard Kingdom Brunel. A set of drawers, labelled ‘Mapmakers’, contains a card catalogue of maps, plans and architectural drawings of various kinds. Indexed by the names of draughtsmen, surveyors, engineers, architects and cartographers, each entry provides very brief details of what is depicted in the document and the accompanying catalogue reference. This card catalogue contains information about drawings that have come to light since the publication of the catalogues described in section 3.2 and includes places that they do not cover. It is arranged topographically, by names of countries as they were at the date of cataloguing. Part of the Summary Catalogue and the draft catalogue for maps and plans from Japan in our reading rooms at Kew. For a few years in the late 1980s and early 1990s, maps, plans and drawings found with documents in series not consisting wholly of graphic material were recorded in a summary catalogue. The catalogues are arranged topographically across a dozen or so files and there are three separate files providing subject indexes. The topographical and subject indexes both provide full document references. A draft, manuscript catalogue of ‘Maps and plans’ for locations and constructions in Japan. It is arranged topographically. Not all the plans and drawings in our collection can be attributed to a specific architect but in some cases they are signed or otherwise identified as the work of a particular individual. The three tables in this section highlight those record series containing significant quantities of maps, plans and drawings relating to architecture and the built environment. These series were inherited from various government departments, notably the former Office of Works, which accumulated series of records consisting wholly or largely of plans and drawings of buildings, or maps illustrating aspects of the built environment, usually in relation to planning and development. Many architectural plans and drawings were filed in series which consisted principally of maps. Catalogue descriptions seldom indicate the drawing material or medium. Catalogue descriptions seldom record the stage in the building project at which a particular drawing or set of drawings was produced (for example, presentation drawings, contract drawings, working drawings, record/as built drawings). In some cases, this can be determined from the drawings themselves, but it is not always easy to establish. The tables overlap in places, and you can expect to find some types of drawings and plans in series appearing in more than one of these tables. A drawing from 1739 showing William Kent’s design for the Houses of Parliament (catalogue reference WORK 29/3358). The plan did not make it past the drawing board. 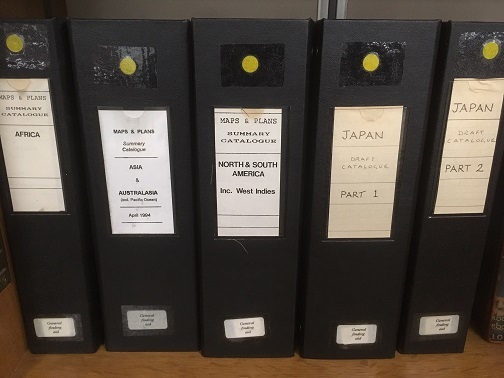 Copies of a card index created by the Office of Works contains information on the drawings in the various Office of Works series (department reference WORK) listed below, and is available in the Map and Large Document Reading Room at Kew. 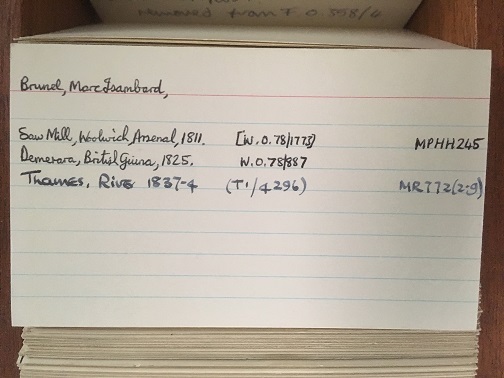 The card index provides a useful way to find records in the absence of detail in catalogue descriptions. Manchester and Salford Exchange Stations layout plan from 1896, held among the records of the London and North Western Railway Company in series RAIL 410 (catalogue reference RAIL 410/796). 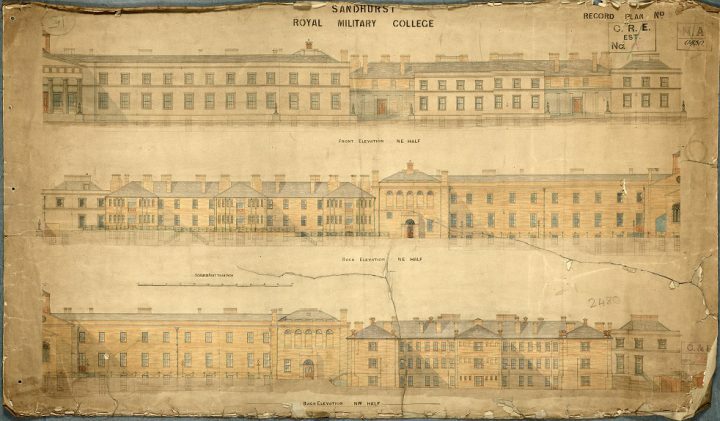 Elevations from 1880 of the front and back of Sandhurst Royal Military College (catalogue reference WORK 43/986). Numerous institutions around the world hold collections of architectural drawings and related records. This section details those with significant collections of material with a connection to our records in their history or content. Large numbers of plans and drawings created by local government and other bodies are held in local authority record offices. For their addresses and contact details, use the find an archive tool or consult British Archives: A Guide to Archive Resources in the UK by Janet Foster and Julia Sheppard (4th edition, Palgrave Macmillan, 2002). Historic England Archive – substantial collections of drawings created or collected by government departments are held by the Historic England Archive. Records shed light on the history of specific buildings built for or occupied by government departments, among other things. National Records of Scotland – holdings include government records relating to public works, and some records of former or present public utilities. National Library of Wales – holdings include government records relating to public works, and some records of former or present public utilities. Public Record Office of Northern Ireland – holds some records relating to British government in Ireland before 1922 as well as specifically Northern Irish records. The National Archives of Ireland – holds some records relating to British government in Ireland before 1922. National Monuments Record of Wales – this is the archive of the Royal Commission on the Ancient and Historic Monuments of Wales. Historic Environment Scotland – the archives include collections on ‘Scotland’s Urban Past’ and the work pf Sir Basil Spence, one of the most celebrated architects of post-war Britain. Research and Special Collections Available Locally – a hub for research resources relating to Ireland, including EHS: Built Heritage, which It aims to identify, record and protect the built, buried and underwater remains of human activity from prehistoric times to the present day. V&A + RIBA Architecture Partnership – a joint venture to bring together the drawings and archives of the Royal Institute of British Architects and the architectural drawings and photographs of the Victoria and Albert Museum. Material on buildings or architects, in the public or private sector, from the Renaissance to the present day. Royal Institute of British Architects – home to one of the largest and most diverse architectural collections in the world. All of the publications listed here are available for consultation at The National Archives library in Kew.